In the first funding period a continuously operated miniplant for the hydroformylation of 1-dodecene was designed, built and tested. To realize an efficient catalyst recycling, a solvent-system with a highly temperature dependent miscibility gap is used. The miniplant contains a continuously stirred tank reactor (CSTR) where the homogeneous catalyzed reaction takes place and a liquid/liquid phase separator in which the product-phase and the catalyst-phase are separated from each other. After phase-separation the catalyst is fed back into the reactor and the product is taken out of the process. It was possible to realize a steady state operation of this miniplant for 200 h with a yield of 63 % of the main product. In the second funding period a sophisticated catalyst recycling was tested. Therefore the influence of an organic solvent nanofiltration membrane on the catalyst behaviour was investigated, to expand the miniplant with a nanofiltration-unit and increase the effectiveness of the process. Furthermore the non-polar solvent has to be separated from the product with a distillation unit and reused in the reaction-step. Also an optimal designed reactor (project B1) was successful tested in the miniplant and compared to the CSTR, in order increase the yield. Further scientific investigations on hydroformylation and hydroesterification reactions in the miniplant lead to the processing of renewable materials. The aim of Project Area D3 is to further develop the methods developed in the two previous funding periods in B5 E for the rapid and efficient process development of integrated systems of reaction and separation. The D3 project aims to implement and test the new continuous processes for reductive amination and integrated hydroaminomethylation (HAM) on a miniplant scale. To this end, new concepts for recycling the catalyst and separating the by-product water must be developed. This is to be achieved by membrane separations in conjunction with TMS. Together with D1, the tandem reaction process is to be compared with a conventional process design.As a new reaction, the reductive amination of 1-undecanal is to be processed first. This builds on the work on hydroformylation in the first and second funding periods. Later, the combination of hydroformylation and reductive amination, the hydroaminomethylation (HAM) of 1-decene, will also be realized in a tandem catalysis. The starting point for the realization of reductive amination and HAM on a miniplant scale is the existing combination of reactor, phase separation and organophilic nanofiltration, ONF. Dreimann, J.M. 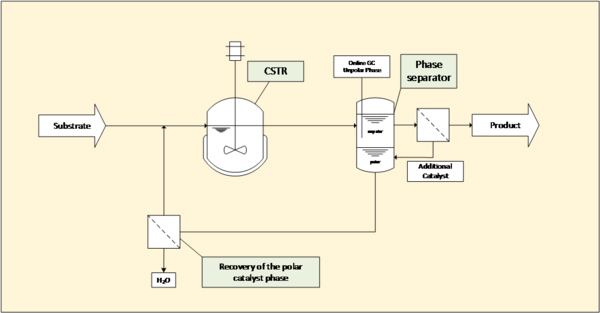 Process Intesification in Homogenous Catalysis – Catalyst Recovery via Thermomorphic Solvent Systems and Organic Solvent Nanofiltration. Technische Universität Dortmund, 2017. Haßelberg, J. Process development for the synthesis of saturated branched fatty derivatives: Homogeneous and heterogeneous catalysis in miniplant scale. Technische Universität Dortmund, 2016. Zagajewski, M. Planung, Bau und Betrieb einer Miniplant zur kontinuierlichen Hydroformylierung von 1-Dodecen in thermomorphen Mehrkomponenten-Lösungsmittelsystemen. Technische Universität Dortmund, 2015.